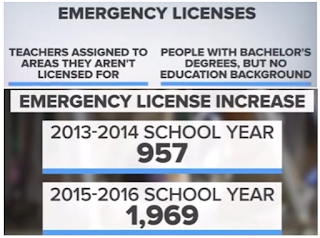 DemoCurmudgeon: Scott Walker's Act 10 wrecking ball lowers Teacher Standards, doubles lower quality "Emergency Licenses!!!" 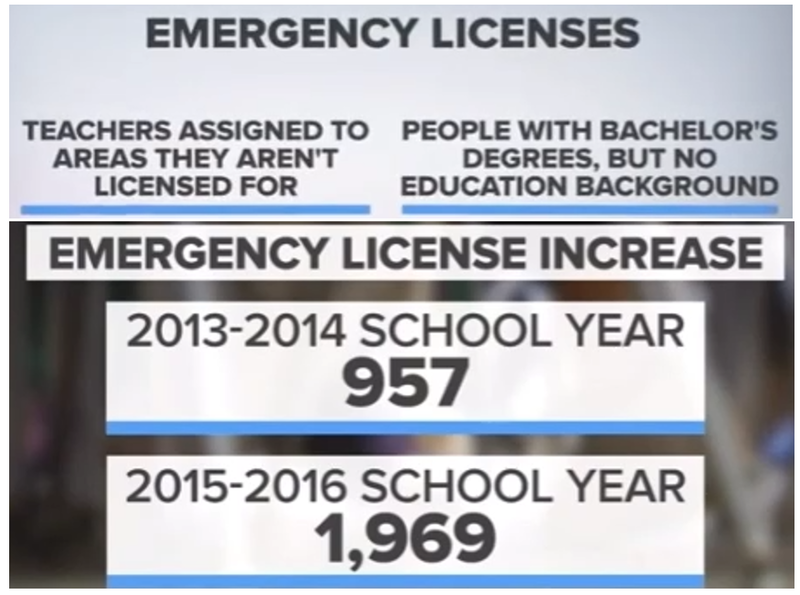 Scott Walker's Act 10 wrecking ball lowers Teacher Standards, doubles lower quality "Emergency Licenses!!!" We're now lowering the bar for teacher hiring in Wisconsin, thanks to Scott Walker's biggest bragging point, Act 10. It's also time for Democrats to drive this point home, now that Republicans are attempting to solve a major problem they created with Act 10 by dramatically lowering the bar for teacher hiring statewide. A rural schools leader said that's not what rural schools asked for. "Heavens no," said Jerry Fiene, executive director of the Wisconsin Rural Schools Alliance. 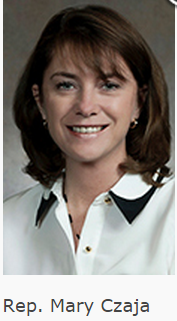 "This totally destroys any licensure requirements that we have in Wisconsin. It's very concerning." Anyone with a bachelor's degree could be hired and licensed to teach sixth- through 12th-grade English, math, social studies or science in Wisconsin And any person with relevant experience — even a high school dropout — could be licensed to teach in any other non-core academic subject in those grades. Czaja agreed it might make it easier to become a teacher in Wisconsin than in any other state. Czaja couldn't name any districts that had asked for the broader flexibilities. "The districts are going to be the ones that hire these people, and I firmly believe that they're not going to throw somebody in there that isn't doing a good job. This is just flexibilities. They don't have to use it." Alan Shoho, the Dean of the School of Education at the University of Wisconsin-Milwaukee, said the school's enrollment is down from historical numbers. He tells us jobs that once had 120 candidates before Act 10 now fall closer to 20. "We can talk about compensation, we can talk about working conditions, but I boil it down to this one word and its respect.". He feels the lack of respect has caused detrimental changes in teacher education. -Some teachers get a taste of today's workplace and leave education entirely … pressures and politics of the job have heightened in recent years … it's common to hear teachers say they feel disrespected by the public, unsupported by their administration and beaten up by parents. -Act 10 has created an open market for teachers, which makes it harder for districts to retain staff with sought-after skills. "Everyone is talking about resignation rates, they're higher everywhere in the past several years," Johnna Noll, director of instructional services at the West Allis-West Milwaukee Public Schools said. Walker also previewed a message he'll deliver on Wednesday, touting historic spending on K-12 education in his latest budget and the impact of his controversial 2011 Act 10 law that hobbled the ability of public teacher's unions to negotiate benefits, working conditions and wages. "Making a historic investment in K-12 education is great, but knowing with certainty those dollars will be invested in improving the quality of the classroom is priceless," Walker said.